I love film noir and particularly the work of Robert Mitchum. To my mind he was the greatest baddie on film. If you haven’t seen the films then you’re missing out. Even if you are not keen on black & white movies, these are well worth seeing. I have always thought he was a better actor than Bogart. So having finished and now published THE JONAS TRUST DECEPTION, I’ve started the next book in the Thomas Gunn Series, THE BONEFISH RUN CONSPIRACY set in the Caribbean. For the longest time I have loved calypso, dating back to my childhood listening to Harry Belafonte (my parents choice) and others. In 1990 was lucky enough to spend a month writing a screenplay, based on a novel by Bernard Cornwall, on Rose Island in the Bahamas for a Hollywood production company. Relaxing in the evenings at waterside restaurants in Hope Town on Elbow Cay – after finishing the screenplay and flying to the Abacos – listening to live bands singing songs like ‘From a Logical Point of View’, ‘Matilda’, ‘Jump in the Line’, I inadvertently discovered the ‘other side’ of my film noir favourite. 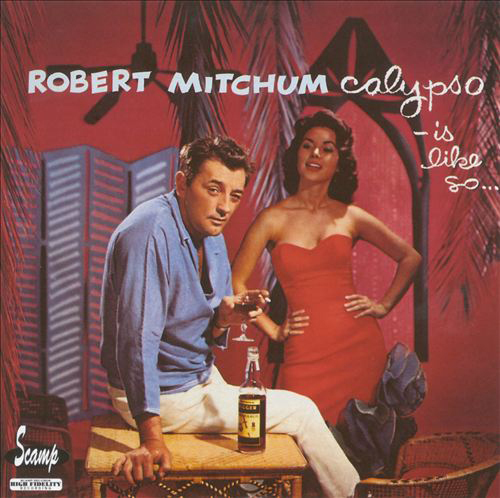 If any among you have not heard his album ‘Calypso – Is Like So’, you should download it and have fun. I’m not kidding you when I say he really does an extraordinary job. You’ll laugh and feel the atmosphere of warm Caribbean breezes and dancing in the starlit night hours full of cracked conch and rum sours. I could get really poetic and nostalgic at this stage but that’s nothing to do with this particular blog. What I really love about Robert Mitchum is that he embraced the different sides of his creative spirit, and allowed himself to express those in his films and in music. Back then straying from the Studio formula was definitely frowned upon, so it took courage and a rascally sense of humour to release this album. Artists these days – whether they be writers, actors, painters, musicians – are boxed and packaged like so much fast food by agents, managers, producers and publishers, and being free to express oneself in a different way is frowned upon. After all, it may affect the corporate ‘bottom line’. Yet the reality is, that many authors have written books in different genres. Perhaps most notably Ian Fleming, whose novel ‘Chitty Chitty Bang Bang’ was of course made into a blockbuster musical film along with the evergreen James Bond series. To my mind writing in different genres is a great exercise for an author. It stretches the imagination and flexes different writing ‘muscles’, which seems to me a good thing, whether or not it increases the ‘bottom line’. My taste in music stretches from Bach to Tone Loc; Erik Satie to PSY; Mozart to Prince and of course Puccini to Mitchum not to mention a whole bunch of Jazz, Ragtime, Reggae, Opera, Bossa Nova, and variations on all the above, so why shouldn’t my writing reflect my love of thrillers, satire and literary fiction? Hooray for diversity, I say.